When I was about 13 years old I attempted to write a novel. 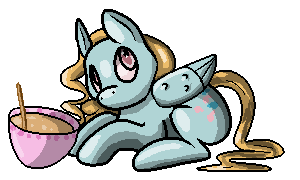 The batter pony is watching you! DO NOT STEAL HER BATTER!- Thank you so much, Philly! I regularly use abstruse words in conversation because to me they are natural and I am incapable of dumbing them down. I don't like the movie Frozen, at all. Don't worry, I despise Frozen as well. On the other hand, I really liked Big Hero 6. Random fact of the day: Everytime I take the kids to a movie, I fall asleep no matter what. My life has brought me two new mortal enemy's. As a child I was classified as stupid as I had reading difficulties, Mum later said she thought I was a little dyslexic but no one ever bothered to test me. I have to read very slowly & often more than once. As a kid I could read the same page several time and get a different scenario every time. I go through phases of sleeplessness then sleep I could sleep for days. When I dream I see them in colour, some I can even control to a degree like a movie. In others I will see myself, my animals, people (or my ute which is weird) in a situation or I am at a place like a room or area that is very detailed & identifiable, but I've never been there. A lot of the time these thing will happen or I will see the place I've dreamed of I don't have control at all over these one & they have a distinct colour to them like looking through a tinted lens. I am terrified of dead fish. Like can sit near a sushi bar at a restaurant scared. I passed out at walmart when my mom made me go get some fish for her. Lady said girl you went down fast. Yeah I'll stick to pet fish not dead ones. Though everytime I see a shark killed I get sad I love sharks. I feel very strongly that the letter "c" should not exist. I like the Twilight books and movies. My favorite characters are Alice, Dr Cullen, Esmee, Jasper. I like the main charters but I really live more the back ground ones. However best vampire goes to Bela Lugosi. I have been chomped by ticks over 2 dozen times this year. Usually I would not complain but the wee bastiches have bitten me on the nethers about 50% of the time. I'm thinking I might need a lawyer. And yesterday a wasp stung me. Did I have my epi-pen yet? Nope. Fortunately the reaction was incredibly mild, so I just kept on working. Heh. If I die, they'll know to look in the dog pens. EDIT: From all of this, I can surmise that I must be fabulously delicious. I have one of those epi-pen things for a mold allergy that is really serious. The allergist tried to give me shots but that didn't work. I ended up having such a bad reaction to the shots I could not take them. The thing is I feel like the reaction to mold is easier to cope with than the reaction to the epi-pen. I would rather use my inhaler and hope I make it. Recently, I went to a thrift store and when I walked in the door the mold smell was so bad I started choking and DH had to rush me out. I was sick for three months. When it comes to stings, I don't seem to have really bad reactions to those. I do have a problem with plants though. If my skin touches a plant I am covered in a red rash. I am such a basket. When I was taking photos for H1m3. 's vacation pony in the cemetery I rubbed against some strange plant and came out looking a bit like Sally. Something went really wrong in the knitting of Tulagirl. 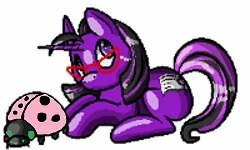 Ask me what's new other than ponies? Sorry, too busy mailing out a custom for Traveling Pony Museum, raiding store for release of newspaper that may contain the article that was just interviewed about my pony customizing, and Equestria Daily features send me more foot traffic, probably how the museum function found me and local fair is how local news paper writer found me. Lololol I'm so pumped, pony customizing is totally my life's true calling. I have been in several stare downs with Rohoe my mom pet rooster he hates me. But I win in all the stare downs. But I am putty to my twin pigmay goats Bridget and Abby I give them too many treats I think. Speaking of pygmy goats my little billy Heinrich got out last night. I have no idea how. I tried to help him get back in but he just ran into the woods screaming. I'd stepped on a sharp mesquite thorn (which is now deeply embedded in my leathery calloused foot and won't budge. And it hurts! YOW!) so I couldn't chase him. I have no idea how he got out. But then, next day he's back in. HOw? Who knows. I sincerely believe my goats can secretly fly or teleport because they can escape any enclosure. Plus I noticed Nigel, my Big Billy Badboy King of da Herd has broken half one of his horns off! It's okay I guess, he's not hurt, but it looks so weird with him having just a horn and a half. And tonight I cut my thumb wide open. I need a keeper. Who will babysit me and keep me safe? I'll look after you Foofoo...... it's gotta be safer than minding Lofty at the moment. Spring has officially sprung here in NZ & twice I've been nipped when he tries to get me to play tag with him. Oo actually I cut my finger open changing the thicknesser blades at work on Wednesday. I can get a bit off with the feeling in my fingers when my neck is bad. It took about three hours to stop the little blighter bleeding. Yes! We need someone who will mummy us and make us yummies. Additionally they should be rich so they could buy us lots of luverly stuff. Obviously we are jinxed. I'd sacrifice a goat to save us, but apparently my goats are jinxed as well. Guess I'll kick Action Hank and hope it brings us luck. Ooo I could kick Sharkbait too or does it count that I bit Lofty today.......... but he bit me first!! I have been wanting her since i laid eyes on her! She is worth at least $250-300. The seller was really nice when i told her i was eyeing this beauty for a long time. She had set a very low starting price of $150 on ebay but said she wanted it to go to a good home, so she lowered it to $100 for me. Oh gosh. I am just..speechless, stunned and oh so grateful!